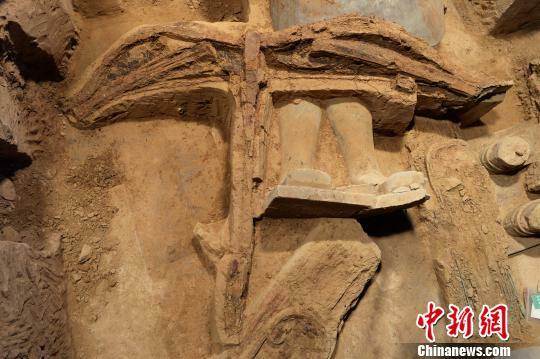 Archaeologists have recently discovered the most complete ancient crossbow to date in the terracotta army pit one in Xi'an, Shaanxi province. Among hundreds of pieces of crossbows unearthed in the past, this one is said to be the best-preserved in general, with a 145cm arch and a 130cm bow string. The bow string has a smooth surface which experts believe to be made from animal tendon instead of fabric and the trigger mechanism is made of bronze, according to Shen Maosheng, head of the archaeological team. Shen also points out that this new discovery sheds light on how Qing, two wooden sticks usually discovered alongside the weapon, were used to maintain and transport the crossbows in ancient times. Although ancient documents often mentioned Qing, its function had never been clearly identified until this recent discovery. "When we dusted off the sticks, we found three holes equidistant from each other and concluded that they were probably used to hang up ropes that fastened the crossbows when they were not in use," Shen said. "It was a great way to keep the arch and string in shape and thus maintain their power in the long run. Besides, Qing was practical to help fix the crossbows during transportation." The best crossbows' shooting range could double that of an AK47, reaching almost 800m, Yuan Zhongyi, former curator of Museum of Qin Terra-cotta Warriors told Huashang Daily. The discovery of the complete set of crossbows will help scientists to create the most precise model of the weapon and calculate its shooting range more accurately.